On May 14, 1907, Johnny Moss was born in Marshall, Texas, a tiny town about 40 miles inside the state’s Eastern border with Louisiana. Town councils usually aren’t that keen on providing historical plaques for hustlers, but Marshall should consider it. A sign reading: “Birthplace of Johnny Moss, First World Series of Poker Champion,” might get a few people to pull off Route 20, look around and grab a hamburger from Jucy’s. That day, one of the greatest gamblers in the history of the world was born. His face should be carved in stone on the Mount Rushmore of poker, if such a thing existed. There are many legendary people in the game of poker, but Johnny Moss stands alone. By the time Moss was 8, his mother was dead and his dad was seriously injured in a work accident. He was forced to work selling newspapers and about the time he went through puberty, he was on his own in Dallas, working for Western Union. The pool halls of Dallas were surely his haunts, and Benny Binion, only three years older than Moss, became his friend. Sometime in 1923, when he was 16 years old, he landed a job at a place called Otter’s Club, where he trained to catch people cheating. Was Moss a cheater himself? He denied it, but there really is little doubt. Poker was massively different back in the road days. Multiple sources claim he did, and he used to angle-shoot in golf and pool, so why not cards? But it was at Otter’s Club and the Elk’s Club where Moss began to hone his poker craft. A good night at these places at this time was $500. That’s about $6,500 in today’s dollars. Moss also got very, very good at hustling pool and golf, but after the Elk’s was shut down, he became a road hustler. Thanks to the Texas oil boom, and the innate ability of survival that all hustlers have, the functionally illiterate Moss would end up a very wealthy man. And why shouldn’t he? It’s frightening to think that Moss might have been a master card cheat, because he was one of the best players of the 20th Century. His dominance at cash games from the 30s through the 70s, when he still played nose-bleed stakes, was well-known and obvious to the professional players that hunted the same jungles as Moss. Puggy Pearson, fellow country gambler and golf hustler, was a Moss admirer. He knew the old guy was a dangerous man. “Johnny Moss would come into a game and look around the table before he bought in. If somebody had $3,000 in front of him and another player had $4,000, Johnny would buy in for $10,000. No matter how much money anybody had on the table, he would double it. You might beat him in a pot or two, but every time Johnny beat you in a pot he broke you if you weren’t real careful. He would have so much money in front of him when he beat you that you were a goner. Sarge Ferris, an old guy named Carlo, Martin Cramer – some real characters – played with Johnny. They were all legends in their own time, but Moss was the best of them all. Nobody could beat him. (from Cowboys, Gamblers and Hustlers: The True Adventures of a Rodeo Champion & Poker Legend, Byron “Cowboy” Wolford). In the 50s, Moss came to Vegas and promptly lost about a half-million dollars playing craps, much of which he lost playing on credit. He returned to Texas, where we continued road gambling, paying the $500,000 back in annual $100,000 payments. 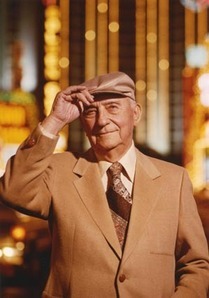 He would return to Las Vegas in 1961, and ran several poker rooms during the next decade and a half, including the Dunes and Binion’s Horseshoe. It didn’t happen. At least not the way Moss told it. There is not one shred of evidence that it occurred in public like that. No newspaper articles have been found mentioning it, even though Dandolos was famous, and Binion failed to mention it during a vast oral history interview he gave with UNLV during the first few WSOPs. Moss supposedly won $5 million from The Greek. It does make for a fantastic story. 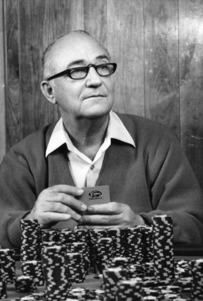 Moss was the man of the hour at the first World Series of Poker in 1970. The event resembled nothing like today’s events. 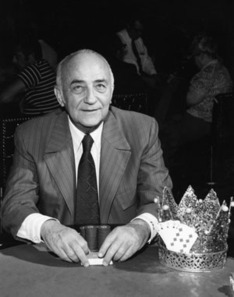 The players in 1970 played a few days of poker and voted on a champion. They voted for Johnny Moss. In 1971, the first time a freeze-out format was used, Moss beat five other players for his consecutive championship. He also won a limit ace-to-five draw event. He’d win his third “main event” championship in 1974, a $10,000 buy-in winner-take-all event that attracted 16 entrants. 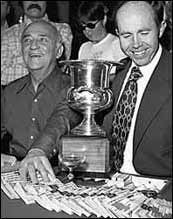 Moss would win five more bracelets in 1975, 1976, 1979, 1981 and 1988. The 1988 bracelet in the $1,500 ace-to-five draw event may be his most impressive. He was 81 at the time. Moss won and lost millions of dollars on the golf course. One of his partners was none-other than Titanic Thompson, a famous hustler from the 30s and 40s. They became friends after Thompson tried to cheat him. Thompson bet Moss $3,000 that he couldn’t shoot a 46 at a nine-hole course in Texas. Moss accepted. “They didn’t know it, but I’d practiced for days with that 4-iron. I’d even given the green keeper a hundred to keep the cups where I liked them,” he said, according to Titanic Thompson: The Man Who Bet on Everything by Kevin Cook. What Moss didn’t know, but was soon to find out, was that Thompson had a guy raise the lips of the cups ever-so-slightly, making putting nearly impossible. After a few holes, the scheme was over, and Moss would go on to win with a 41. The is the huge difference between normal people and hustlers. Moss wasn’t mad, he was impressed. He just had his confederate walk ahead and tramp the cups back down. He even decided to partner with Thompson. Again, from Cook’s book. The First Flight balls, of course, had steel centers. So was Moss a cheater? No. Did he cheat? Yes. Does it really matter? Moss died Dec. 16, 1995. He was 88. It Was a Weird One!